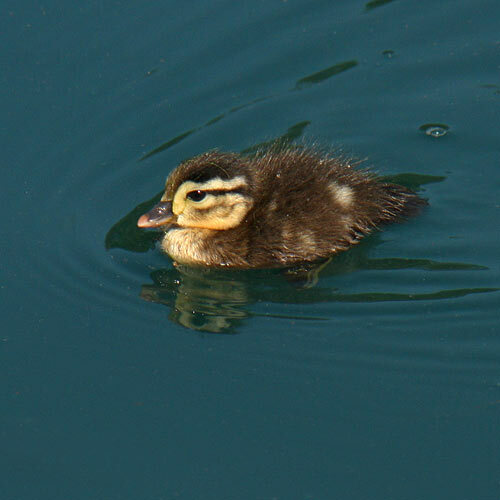 We have two common types of ducklings in eastern Nebraska and several other types of water birds that are less common, such as coots and grebes. Wood ducks nest in holes in trees, often in urban neighborhoods. Newly hatched chicks and their mom jump out of the tree after they hatch and walk to water. If you see baby ducks following their mom across lawns and parks, quietly step aside until they have left the area. When threatened, wood duck mothers will fly away and leave their ducklings unattended on the ground. They will circle the area in flight or they will roost in a tree until danger passes. They will return to their ducklings as soon as you leave the area. Mallard ducks nest on the ground, often in urban landscaping. After hatching, ducklings will walk to water behind their mother. When threatened, the mother will stay on the ground with her young, and try to herd them to safety. Before you disturb any ducklings, it is important to identify what kind of ducklings they are. Wood ducklings are smaller than mallards of the same age, and can be identified by the fact that they have no line between their bill and the front of their eye. They do have a line from the back of their eye that runs toward the back of their head. Mallard ducklings are larger than ducklings of the same age, and can be identified by the fact that they do have a line between their bill and the front of their eye. The line on the side of a duckling's head will run from the back of the bill, through the eye, and on to the back of the head. If ducklings or goslings of any kind are uninjured and with their mother, please leave them alone. If any duckling is injured, you can catch it and bring it to NWRI. If ducklings are with a mother that has been killed, you can collect them and bring them to NWRI. If you have ducklings in your pool and they don't seem to be able to get out, you can either gently net them and put them on the ground next to the pool, or make them a ramp out of a long, rough board, or similar item. Place the ramp in the pool and leave the area. If the mother doesn't return for her ducklings once they've been taken from the pool (see above), you can bring them to NWRI. All ducklings should be placed in a cardboard box and placed in a dark, quiet, warm place until they are brought to NWRI. Do not give them food or water, and DO NOT HANDLE THEM. The simple act of handling a baby wood duck typically results in death. It is important to minimize handling for this reason. If you find a baby water bird of any other type, call us for identification and advice.